As London Fashion Week drew to a close and normality resumed, this week has been all about settling back into my usual routine. Back to work with lots of planning to do ahead of our trip to SXSW, and a few lovely blogger events, plus an incredibly exciting project with Grazia and The Debrief! … Street-styling it at Somerset house! I’m the first one to shout out about how Fashion Week is not all about going to Somerset House to get papped for your street style, and as you can tell in the pic above, I came straight from the office but styled up my monochrome work outfit for a few pictures. Somerset House is such a beautiful setting, you always see so many bloggers and fashionistas getting great outfit snaps, and you can see my shots from Day 1 of LFW here, with more to come soon! … Recharging my batteries (literally) at The Apartment. This year was the first that I paid a visit to The Apartment. A haven where bloggers can relax, recharge, get makeovers, eat and chat between shows during London Fashion Week. Set up in a beautiful apartment in Covent Garden, Abi (from Abi Marvel) works with lots of great brands to fill The Apartment with super goodies, such as ASOS beauty, Aspinal of London, Kurt Geiger, Reiss, Canon etc which bloggers can borrow to use of wear throughout fashion week. You can see more about my time in The Apartment on my Grazia video here. 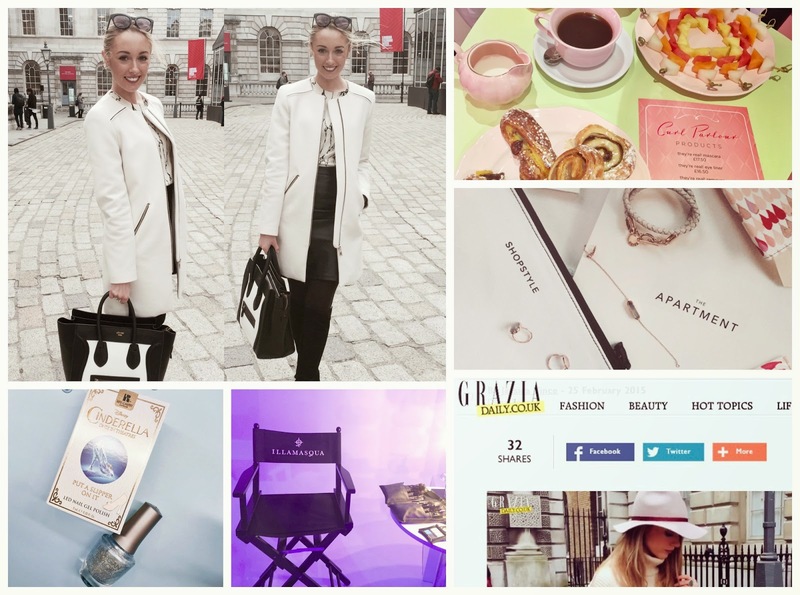 … Filming behind the scenes blogger action with Grazia and The Debrief. I was invited to join an incredibly exciting project over London Fashion Week by the team at Seen.It (an app which lets you create and edit videos) to film ‘What Bloggers Really Get Up To at Fashion Week’ for a behind the scenes video for Grazia.com and The Debrief. You can see the videos and find out more in my post here! … Getting glammed up in the Benefit Curl’s Best Friend parlour! If you live in London then you absolutely must visit the new Benefit pop up in SoHo! I was invited to visit the parlour on their launch day to experience all that the parlour has to offer, including Curls, Cupcakes and Cocktails! Find out more about the #CurlsBestFriend parlour here. … Embracing Blue with Illamasqua and Morgan Taylor. A colour which I haven’t worn since I was 9 years old, and this week, not one but two brands launched a new collection based around the shade! Fuel PR invited a group of bloggers and friends to join them for an exclusive screening of the new Cinderella film at the Soho Hotel to celebrate the launch of the new nail polish range from Morgan Taylor. The film was fabulous, with us all in tears (of laughter or sadness!) and one which I highly recommend you see when it comes out in cinemas at the end of the month! Illamasqua launched their newest collection in the Ice Tank Studios and invited us all to try a blue lip or eye (both surprisingly flattering!) and I’m looking forward to trying out their newest collection! Previous Post Curls, Cupcakes & Cocktails at Benefit’s Curl’s Best Friend parlour!